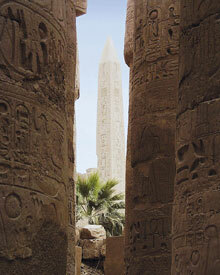 The temple town of Karnak is the biggest religious area of Egypt. In the maze-like temple complex of Karnak God Amun was worshipped here as well as in the smaller Luxor temple. Through huge stone entries you enter the outstanding yards. The spectacular array of pillars is amongst the world wonders of antiquities and provides a square the size of the Dom in Cologne (50mx100m), 142 pillars in 16 rows are one of the most outstanding buildings of the human race. 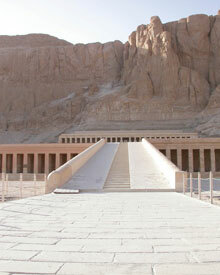 A 3 km long avenue connected the temple of Amun of Luxor and Karnak. On both entries ram headed sphinxes are situated, some of the ram headed sphinxes were changed to human heads in the 30th Dynasty. Two 15m high colossal statues, which show Ramses II and a 25m high obelisque, are guarding the gate of holy Amun. The counterpart of the obelisque has been given to France from Pascha Mehmed Ali. It stands on the Place de la Concorde in Paris since 1836.Inside the temple the visitor will admire a forest of pillars, which show hieroglyphs like the walls. They tell the story about God Amun, and about the resting place of the Pharaohs, especially of Ramses II, who has his name carved in most of the bas-reliefs and statues.